The West Coast Florida retirement communities page covers more of the southwest region which is the most popular area for retirees. There are more seniors in this area than the state's average. It is not as crowded as some other areas of Florida. The county with the largest land mass is Collier County while the most populous are Sarasota and Lee counties. The west coast of Florida lifestyle, which is also "laid back," attracts those coming from California. One finds the white sand beaches beautiful and fascinating. The climate of the West Coast of Florida varies depending on where one is, and may determine where one lives. It varies from subtropical in the north to tropical in the Naples area on the West Coast of Florida. Go to Tampa for the counties of Hillsborough, Pinellas, Manatee and Pasco. Sarasota and Manatee Counties. Lakewood Ranch is a master planned community with several builders and now over 55 builder Del Webb has the first over 55 community there. The location, convenient to Sarasota, is ideal. It is gated and low maintenance and planned 1300 home sites for single homes and possibly some villas. A wide range of floor plans including smaller ones to large. Resort living with amenities galore and on-site Social Director. Lakeridge Falls - Sarasota - 4200 Lakeridge Blvd. - Price: $$ - Gated, low maintenance, community built in 2003 characterized by tile roofs. Three communities comprise Lakeridge Falls. Stirling Falls contains 151 spacious individual homes. Victoria Falls is 110 duplex villas. Sandstone Falls is 138 garden villas. All this on 170 acres. Some amenities include clubhouse, heated pool, spa, card rooms, bocce ball and more. This community is just minutes to downtown Sarasota and 15 minutes to beaches of Lido and Siesta Keys. 4200 Lakeridge Blvd., Sarasota - Contact local Realtors for resales. Cascades - Price: $$-$$$ - luxury single homes in the guard-gated community featuring tile roofs and large clubhouse; indoor and outdoor pools, large tennis complex, fitness, activities and more. Bent Tree - Price: Varies - This is a mature, gated condominium golf community of single homes built around Bent Tree Country Club - Optional golf - Heated pool - social activities - some over 55 neighborhoods in development. Forest Pines - Grand Blvd. - Price: $ - older single-level condos in a maintenance-free community - amenities include pool, recreation facilities. Gulf Shore of Longboat Key - Price: $$ - Mature development for 50+ consisting of mobile homes with beach access on the Gulf of Mexico. Amenities include boat slips, dock and pool. Sarasota Harbor - John Ringling Blvd. - Price: $$-$$$ - This is a waterfront community with marina slips, when they are available. It is an older community in a great location because some have Bay views. Siesta Harbor - Portofino Dr. - This is a boating community, in Siesta Key area, of condos in mid-rise buildings. - Price: $$ - It has beach access, deep water harbor, fishing pier, pool, spa, and other recreational amenities. Strathmore Riverside - Off Riverbluff Pkwy - Marina community of 70's detached villas. Price: $-$$ - It has a pool and recreational facilities. Aston Gardens at Pelican Pointe - You can rent a luxury apartment or purchase a villa. Independent senior living with assisted living available. Well landscaped grounds with walking paths. Minutes from downtown Venice. 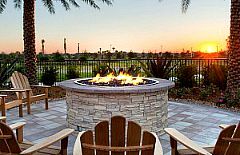 Price-$, Attached villas from low $200's - Size-Medium - gated - Resort amenities - North Port, FL paired villas and single family homes by Del Webb. Kings Gate Port Charlotte - If a person likes large gated communities with golf, this may be the right place. Some of the many amenities include a particularly large swim pool and 18-hole golf with tropical resort feeling. Also, rentals are available at the real estate office on the site. There is a large selection of differing home sizes. Prices started in mid-$100's. Southwest Florida is popular for tropical climate and beautiful beaches. It is also less crowded than other areas of Florida, making it attractive for retirees. The Ft. Myers area is a more affordable area than the Naples area. In the current real estate market prices have come down allowing more buyers to purchase on the pricey Southwest coast of Florida. By GL Homes - From very low $300's - Social clubs, luxurious clubhouse, pools, cabanas, spa, fire pits, clay tennis courts; attached and detached home collections. Some luxury interior features are standard. Luxury homes by Toll Bros. Not over 55 but a private, gated community in great location. Social membership to Spanish Wells Golf and Country Club and Tarpon Cove Yacht and Racquet Club. Amenities include first-floor master suites, tennis, golf and 15 minutes to Gulf beaches. From $400's. 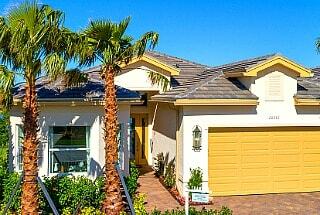 By Lennar - Large manor Homes with planned clubhouse, pool; lake. From $300's. FEATURE: One of the most popular communities on our site with Town Center, gated, and so many amenities including golf. By WCI Communities (Now part of the Lennar family of homes) - Elegant community of single homes, villas, carriage homes with 27-hole golf course, social activities, recreation and much more. 38 acres of preserve (verify). Large starting in high $100's-$500's. By DR Horton - Brand new medium to large homes start from $213's. Within the River Hall master community with many amenities including golf, tennis, and waterfront views. Cinnamon Cove Retirement Community - Ft. Myers - Beaches nearby - More than 700 condominiums, singles and villas in this gated community - Clubhouse, Fitness Center and more. - They note: View this gated community only with a prior appointment with Realtor or resident of the community. Heritage Cove in Fort Myers - Price: $-$$ - 169 single family homes and condos - community center, pool, beach, gated, tennis and more. There are many social clubs including a Veterans Club. Seven Lakes - South Ft. Myers - golf and tennis gated community of 1000+ medium-rise condos and villas. Play 18-hole golf at no extra cost since included in H/O fee (verify). Other amenities include pool, woodshop and more. Prices in very low $100's. U.S. 41 North of Daniels Pkwy. Low-priced condos in Fort Myers/Cape Coral-bargain-priced. Avalon Place Condos - 6th Place, Cape Coral - 2-bedroom/2 bath garden condos - canal frontage, nearby fishing areas and boat docks. Brandywine - South Ft. Myers - gated low-rise condos and attached villas in an area known for golf courses. Amenities include clubhouse, 2 pools, spa, tennis, social activities and more. Gulf access. Resales from low $100's to $200's. Del Prado Park Townhouses - Cape Coral - 70's condo of 2 BR/2 1/2 Ba in 2-story building - Amenities include clubhouse and pool - no pets (verify) - outdoor parking - priced below $100's. Forest Creek Villas - Bonita Springs - 23 duplex buildings next to a creek. Pine Ridge of Fort Myers - On Lakeside Club Blvd. Gated 2 and 3-BR villa condos with pool, tennis, lake, walking path and more. Price: under $100,000. Also rentals listed on the website. Seminole Garden Apartments in Seminole (Fort Myers) garden style, mid rise co-op - Management office Phone: 727-397-2534 - 8275 113th Street N., Seminole -many social clubs and activities - 53 acres and 2 lakes. Seven Lakes - Cypress Lake Dr in Fort Myers - 2-bedroom condos with golf - Golf fees are included in condo fee so that residents can use 18-hole golf as often as they want. Price: Under $100,000 and up. Pool, tennis, woodworking shop and more. Terrace Condo Village at Cross Creek - This is an active adult neighborhood within the gated Cross Creek Country Club development of 905 homes. Popular golf course community recognized for its value and amenities. Good opportunities among higher-priced homes. Cross Creek Blvd. and Daniels in the southern part of Ft. Myers. The Anchorage - Cape Coral - 2 bedroom/2 bath low-rise condos from the 70’s. Clubhouse, pool, docking for boats. Water views from balconies and Gulf access. Prices in medium $100’s. 19th Ave. See local Realtors for resales. Tropic Terrace Gardens - condo villas in North Fort Myers on Pangola Dr. - priced under $100,000. Windsong Condos - Cape Coral - 2 bedroom/2 bath low-rise on canal with views.Priced in low $100’s. 46th St. and Del Prado on canal. Built 1979 (verify). Village Green of Bradenton - 2-bedroom villas - Village Green Parkway - 10 minutes to Anna Maria Island beaches. Pool - Low H/O - Built in 70's - hovering around the $100,000 mark and higher. See Realtor for resales. Gated community with lakefront clubhouse. 2- and 3-bedrooms with flex rooms and first-floor living. From $300's By Lennar. Gated community by CalAtlantic of 64 2 and 3-bedroom luxury condos in a waterfront area. Many amenities including private beach, pool with cabanas, golf, tennis, convenient to downtown and more. From low $500's. Price-$ to $$, Size-Medium. It is in a master planned community in Collier County of small to medium carriage, villa and single-family homes. 2 and 3-bedroom/2 Baths. Some amenities include outdoor heated pool, restaurant, and 18-holes championship golf. Prices start $204,990. Discovery Overnight Pass (see rules). 36 miles to Naples on the coast. Verona Walk by DiVosta in Naples - Price $$-$$$$ - Development began in 2003 and projected 1984 homes built in phases. Two and three-bedroom single-family homes and townhomes. It is guard-gated and has a resort pool, tennis courts, and much more. Not active adult. Resales only. Phone: 877-235-8138 - 7676 Collier Blvd. 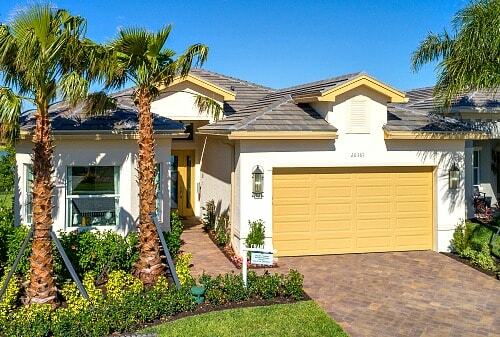 Pelican Marsh at Naples - Price-$$ - Size-Large - An Aston Gardens community. These are upscale purchase villas or rental apartments in an independent living community. It has assisted living suites with services. Enjoy a country club lifestyle with golf. Upscale rentals listed on site. See your local Naples Realtors for resale listings. Courtwood - Palm River development in North Naples of low-rise condos built in 80's. Amenities include pool and lake. No RV parking. Executive Club - at the Moorings - boating community of condos in $400's. Fairways Naples - Start under $100's - pool, golf, medium-rise condos of small square footage - rentals allowed, clubhouse, pool. Forest Lakes - condos and single family homes - golf, prices start $100's - 6 miles to "Old Naples"
Ixora Court - Priced in $300's. Park Place - Seagate neighborhood from $200's to over $1 Mil - single homes. Valley Stream - Lely area of East Naples - garden style priced in $100's - good location near "Old Naples." Villa Versailles - condos near "Old Naples." Pool.